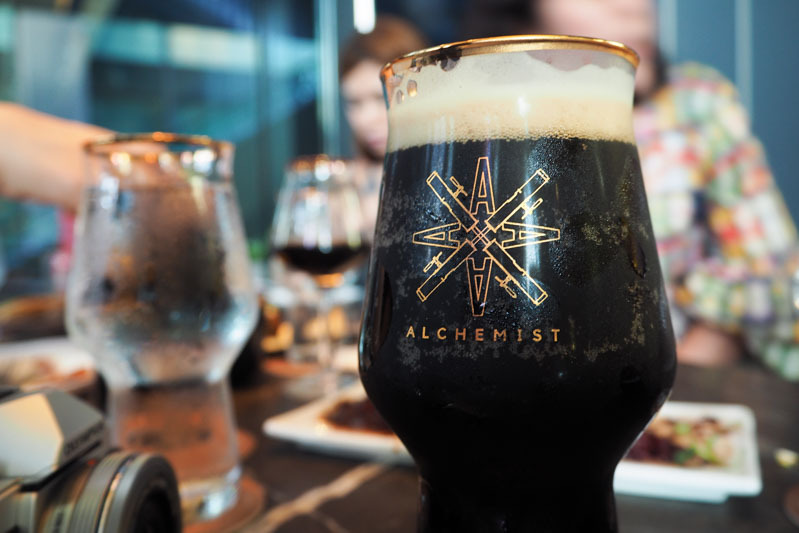 Alchemist Beer Lab is run by the same team behind Little Island Brewing Co. at Changi Village. 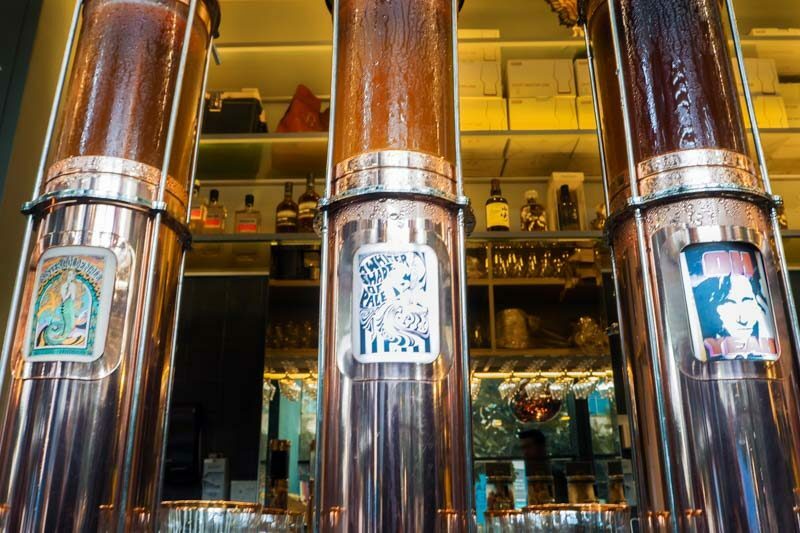 Quite unlike any other microbreweries in Singapore, the bar is offering a tasty selection of infused craft beers that will create new favourites amongst beer lovers. 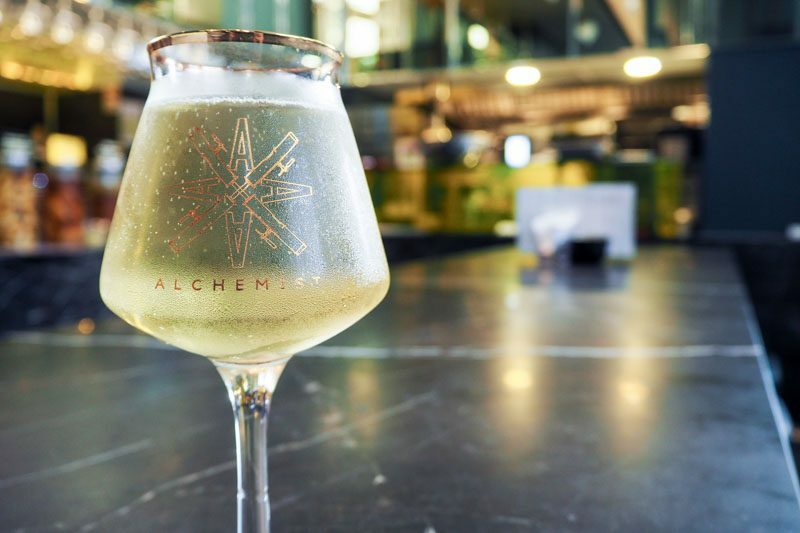 Just as its name suggests, Alchemist hopes to turn its beers into gold, to make a mark on our sunny island’s drinking scene. And I’m pretty sure they’re well on their way to doing that. 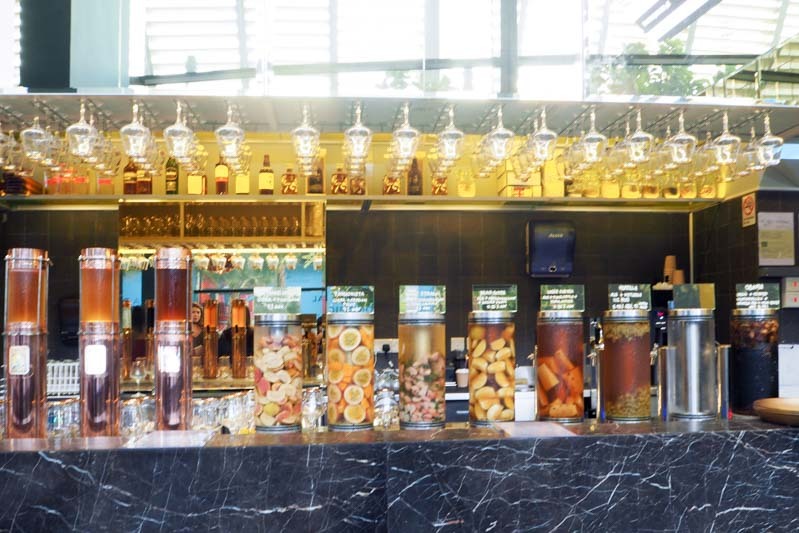 Located at the basement of the newly opened South Beach Tower, just a couple of steps away from Eplanade MRT exit A, the bar is a great hideaway from the bustling streets on ground level, offering a cosy place to chill and hang out after a long day at work. 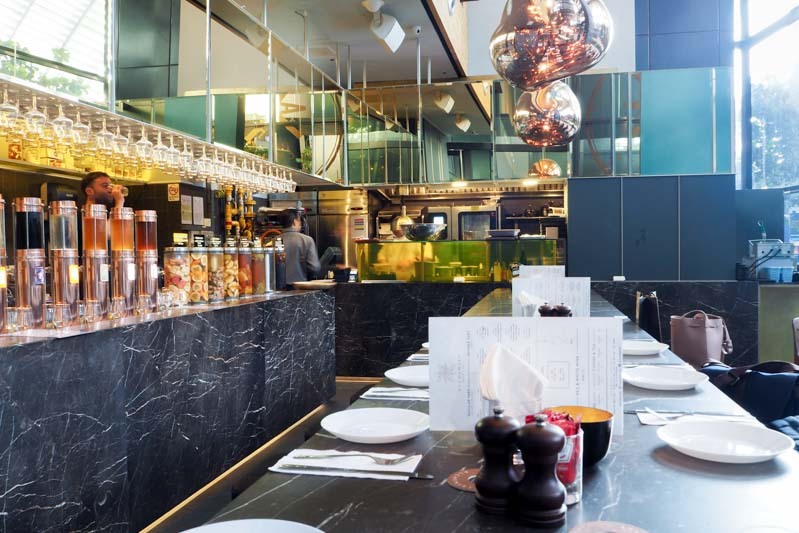 Adorned in colours of grey, copper-gold and brown, the bar is polished yet unpretentious, alluring and inviting on the whole. Its nine-metre tall high ceiling, along with the floor to ceiling windows, opens up the indoor space, and its marble kitchen counter makes for a warm get-together spot. Guest could also choose to sit outdoors at its alfresco area, which occupies the space right beside the escalator. An airy and breezy area to have talks over a drink or two. 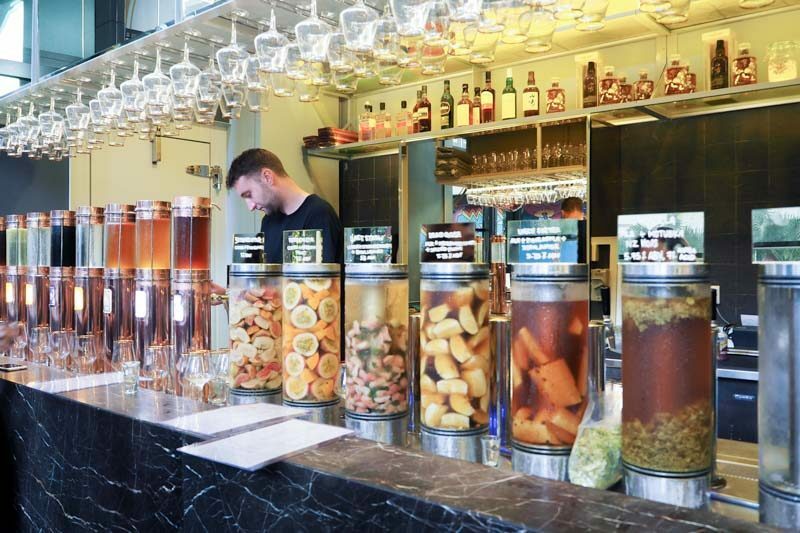 The 16 sleek infusion towers is a sight to behold, instantly capturing our attention — two types of infusion systems are used at Alchemist Beer Lab, of which one holds up to one-litre of beer, and the other up to three-litres, from Poland and the US, respectively. Getting all busy, Head Bartender Barnaby Murdoch, along with the other staff from the bar, started pouring out sample-sized shots from the taps to let us have a taste of the different infused beers. Starting with the lightest in alcohol content (cider) to the heaviest one (stout), they kindly walked us down the towers while explaining the ingredients that are used in each of them. A total of seven infused beers were on display, three were ciders: 50 Shades of Pink, Passionista, Last Straw, which are a refreshing start to the early evening. They were sweet and crisp, semi-dry. Unlike traditional methods of infusing beers by boiling the ingredients over long hours, the natural flavours are extracted by the fusion chamber using compressed gas (carbon dioxide), lasting between 30 minutes to two hours before the beers get injected into each tower. They are changed at least once every week to ensure the beverages are fresh, but we were told most of these towers depletes within two to three days — a sure sign that the drinks are gaining popularity. Do note that apart from the golden ale and stout, the ciders are not brewed in-house, but imported from elsewhere. Nonetheless, equally delicious to sip on. If you’re not too familiar with Little Island Brewing Co.’s beer offerings, drinks like the Sister Golden Ale (golden ale), That Old Black Magic (nitro dry Irish stout), Whiter Shade of Pale (pale ale), and Oh Yeah (Singapore pale ale – SPA) are also available on the tap. Going unnoticed, shots and shots of samples were coming out from the bar counter quickly, quenching our beer thirst and whisking us off our feet with the different, intense flavour profiles. Here are some of our favourites, and would definitely snag a couples of glasses more if being inebriated had no correlation to alcohol consumption. 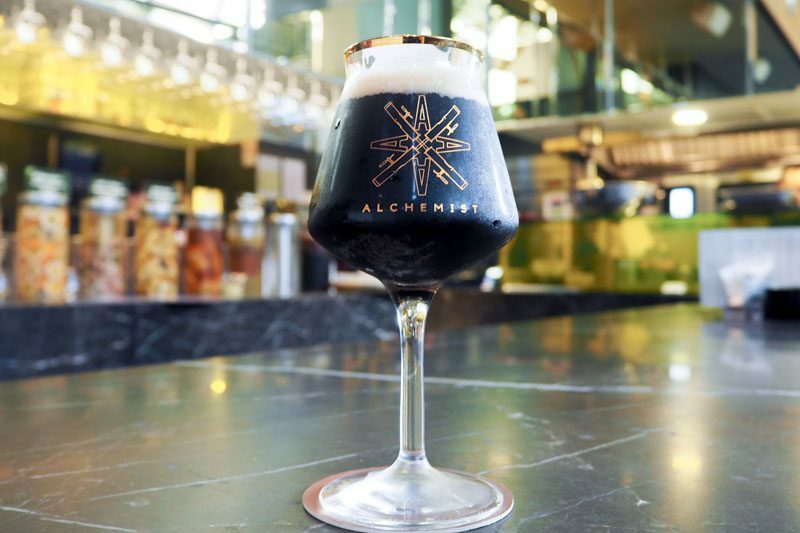 The infused beers are brilliantly served in a specially designed goblet-like glasses, paying homage to the medieval ages that the bar lends reference from. The 50 Shades of Pink consists of cider and a whole lot of pink guavas peeking through the towers. Tempting yet decently coy at the same time. Perfuming the cider with its strong fruity fragrance, it was quite the winner out of the lot. Crisp, semi-dry, yet so easy on the palate. I’m a fan of sweet beers and wines so you bet I’m onto this. And also the colour PINK! (please just excuse my bimbo-tic moment). I’ve hung out with Obama, and I liked it! If you’re not part of the camp-malty sort, Obama will change your perception of it. 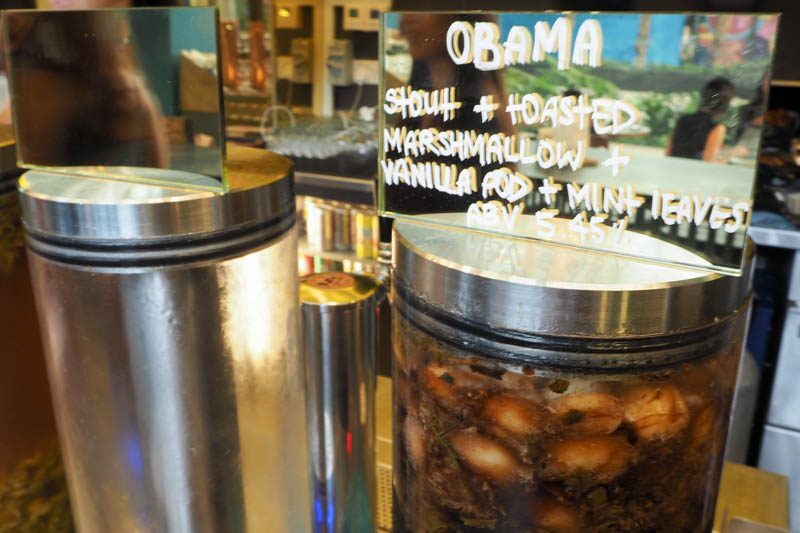 With toasted marshmallows, vanilla pods and mint leaves floating gracefully within the tower of Obama, which could possibly pass off as a herbal drink of some sort that you can find at ubiquitous rustic Chinese medical halls, BUT looks are definitely deceiving. Obama is bold, rich and creamy from the marshmallow, fragrant, a tad sweet with subtle minty hints to cleanse the palate in between sips. The most unlikely pairings you could think of, but all of which worked harmoniously well. All right, maybe I’m a bit sua ku (uninformed), I’ve never seen hops in its pre-beer state. 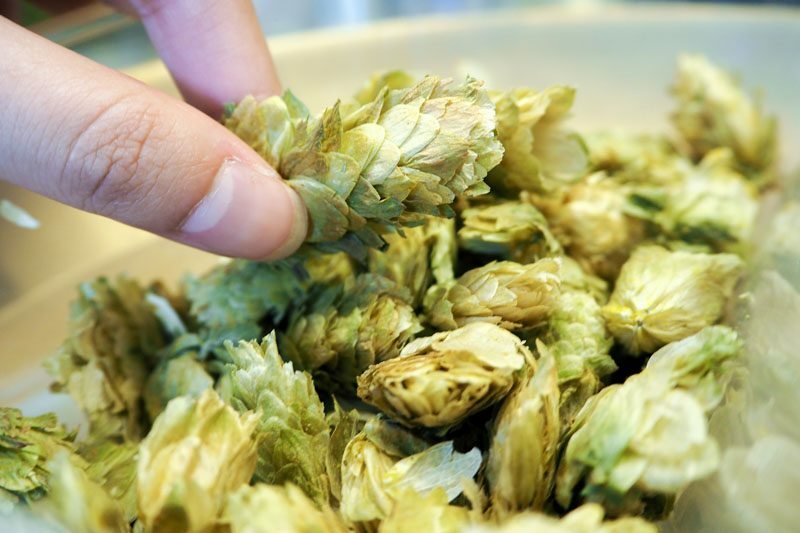 Together with roasted barley, these delicate and fluffy flowers create the bitter, citrus flavours in beers. Alchemist Beer Lab stash these babies in bags, keeping them cool and dry in the fridge, so you know that you’re getting really fresh beers here. 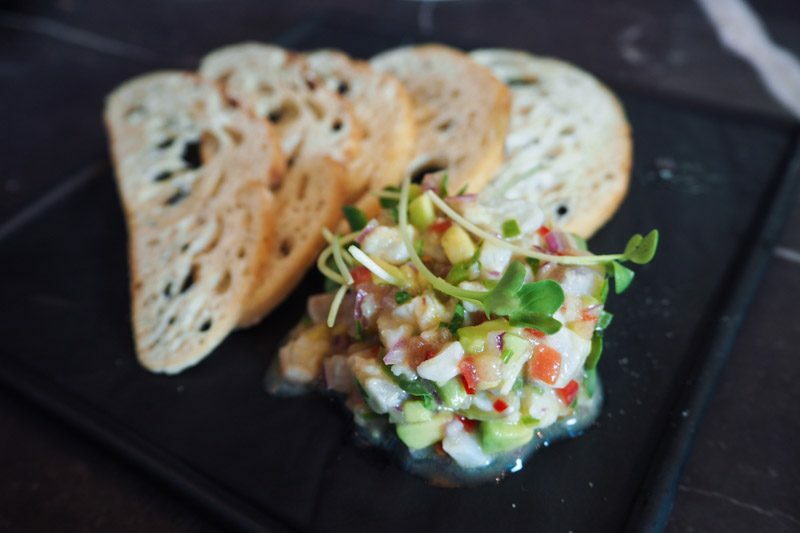 The bar is not only about its infused craft beers, they are also absolutely serious about the foods they put out on the table, with its kitchen helmed by Executive Chef John Edwards. He has put together an extensive menu of Modern-European tapas that will keep your tummies filled and happy, alongside the yummy beers. 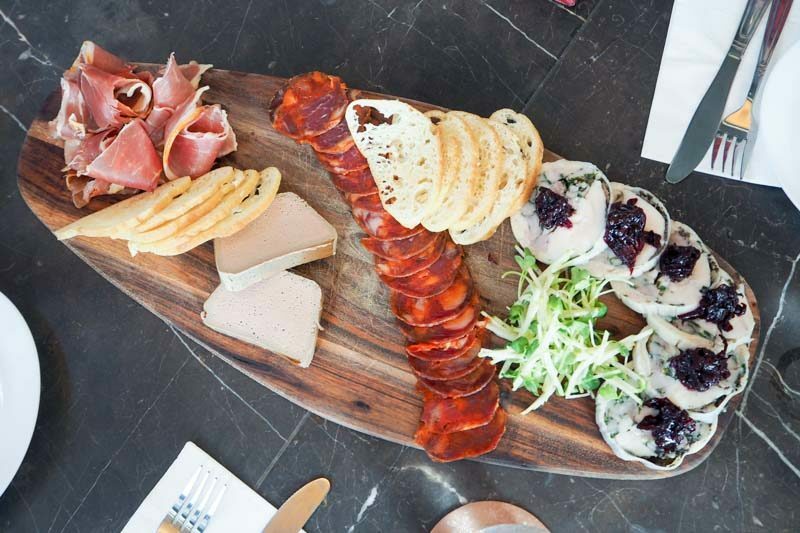 To be shared as a starter, a smorgasbord of iberico sausage, San Daniel prosciutto, chicken & black truffle ballotine, duck liver parfait with calvados jelly. 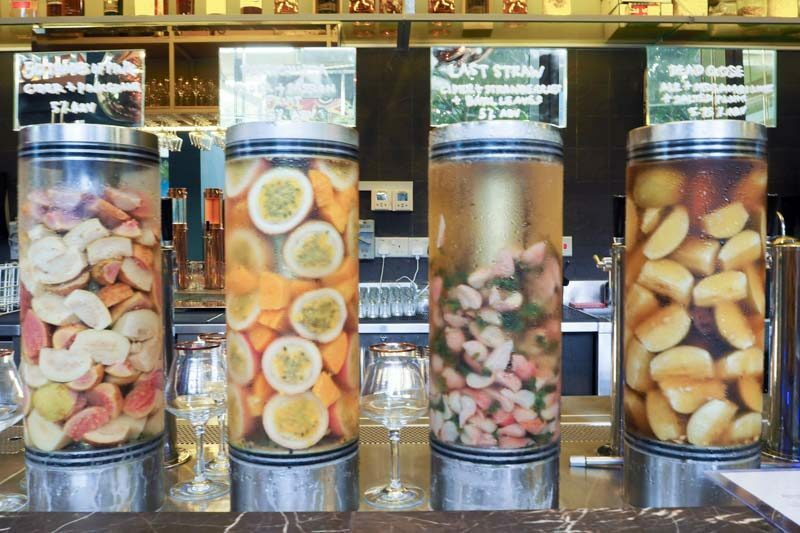 Beautiful to munch on while washing each bite with the infused beers. What’s an Asian dish doing amongst the modern-European dishes? It doesn’t matter, cos these wings are essential grubs for drinking. Barbecued till slightly charred on its skin, the golden brown wings are well marinated with coriander and honey, so amazing to have on its own. 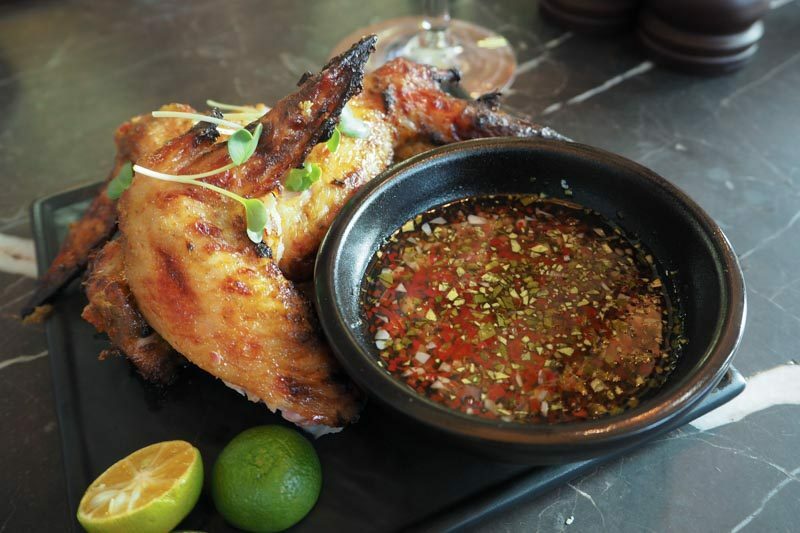 A generous portion of nam jim dressing is served in a wide dish for dipping the entire wings into the tangy and sweet sauce, it even has chunky garlic and chilli bits. You’ll be guilty of double, triple dipping. Cooked till soft, the pork cheeks tears apart easily with little help from the knife. 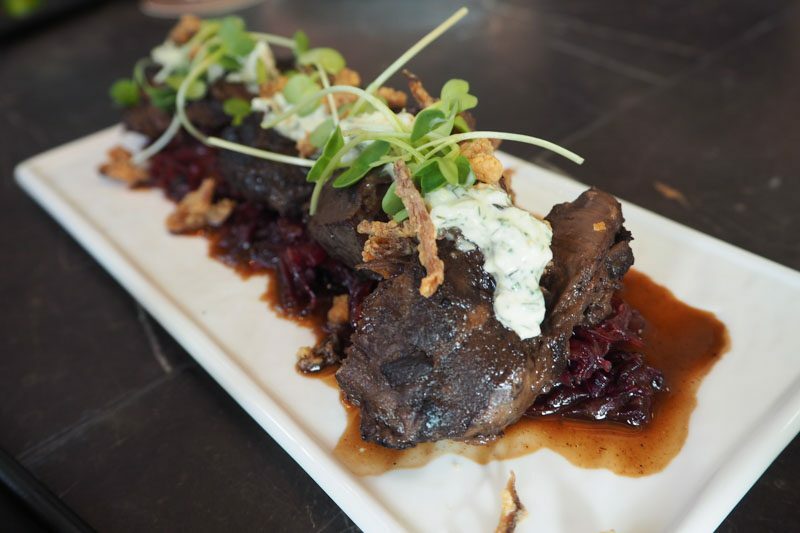 It rests atop a bed of sweet and sour red cabbage that cuts through the heaviness of the tender meat, and is drizzled over in cabernet syrup. What’s really interesting is the garnish used and you’d be surprised that the crisply breaded bits are actually made of pork’s ears! You thought it was anchovies, didn’t you? 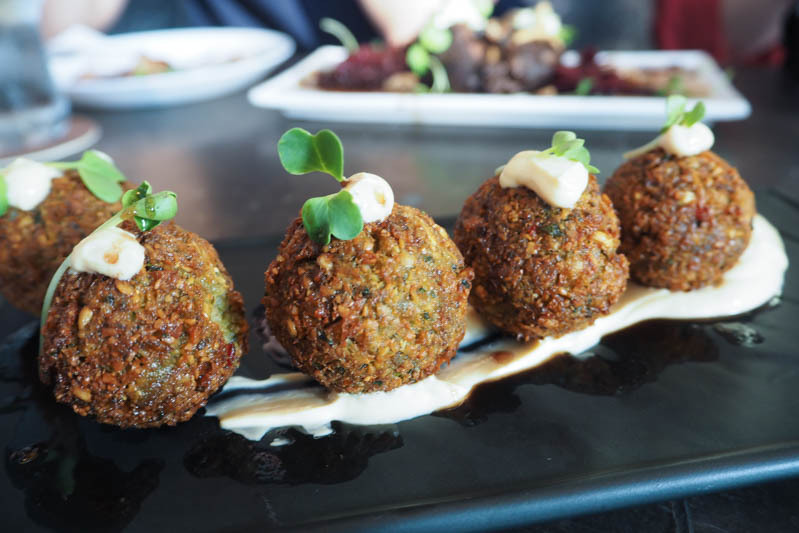 Moist and crunchy, these bad boys are made up of smoked eggplant, pickled red onions, mint, and black olives, all packed up into a tight round ball before being deep fried. Then, decorated with paprika yoghurt that balances its taste. Unassuming as it may look, these thick cut fries are thoroughly enjoyable. 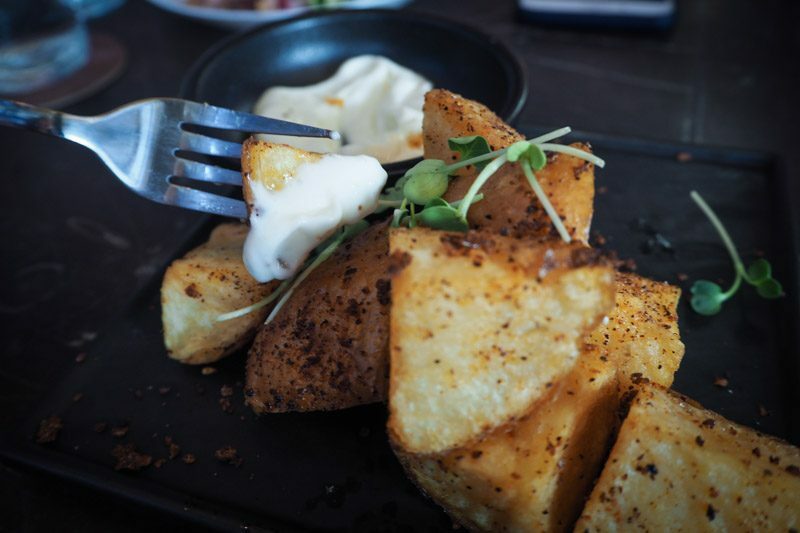 A loud and resounding crackling chime can and will be heard upon bite, while the potato remains soft and warm inside. A personal favourite, I could finish the entire plate on my own, but some little bird did mention that gluttony is one of the seven deadly sins. Packed in a cake, bits of fresh snapper are doused in tequila, lime and hot sauce jelly. The zest-y bits are refreshing and so irresistibly appetising. You know how they always save the best for last? Here it is, ending the entire experience with a stellar dish. 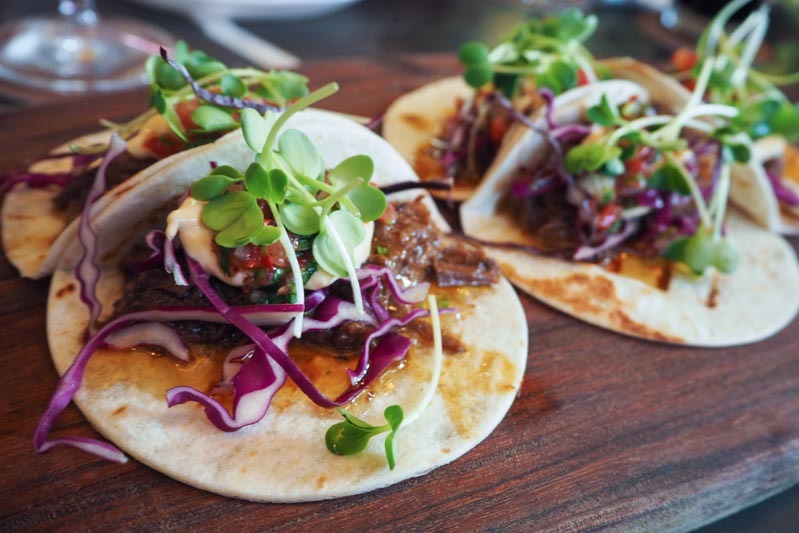 Dripping in decadent gold gravy, its soft and tender meat snuggled up warmly in the doughy tortilla to give this sinfully delectable tapas. 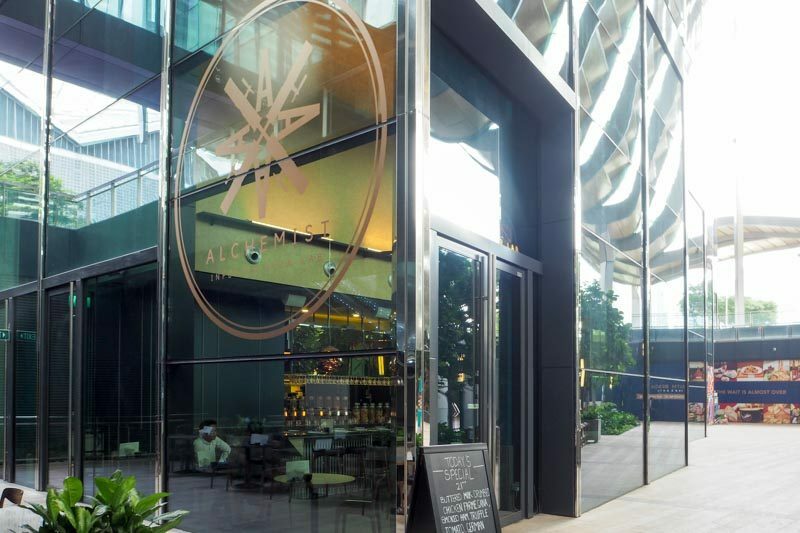 If you’re working nearby or simply just lounging around the City Hall area, drop by Alchemist Beer Lab to indulge in good food and thoughtfully crafted beers. 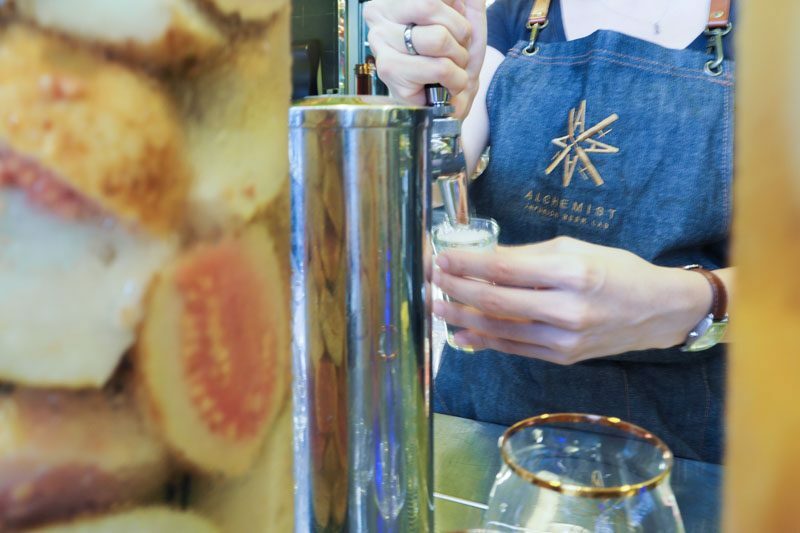 These infused beers will be so pretty for your Instagram feed too, hint hint. The beer pricing ranges from $12 and $15 depending on the time of drinking, you could ask for a party pack of three ($30) to try the different flavours, or ask for a sampling size that’s not on its menu. I live to eat, write, and fall in love with the world. When I'm not hustling, you'll find me curled up watching Netflix.